What is the customs process in Finland to import? How is import cargo released from Finland Customs to importer? Who are the parties involved in import customs clearance formalities in Finland? Import cargo clearance in Finland Customs. 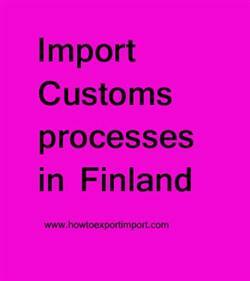 The information provided here details on how to import goods to Finland especially import customs clearance procedures in Finland. Finnish Customs or Tulli (Tull Customs) is the national authority responsible for enforcing customs laws and regulations in Finland. They facilitate the trade in goods and ensure its conformity, levies taxes on goods efficiently, work for economic development of Finland etc. It is supervised by the Ministry of Finance of Finland and is part of the EU customs system. The Union Customs Code (UCC) is part of the modernisation of customs and serves as the new framework regulation on the rules and procedures for customs throughout the EU. You need authorisations and registrations to fill in a customs declaration. The importer can likewise then declare the goods by presenting a finished Single Administrative Document (SAD form) to Finland Customs. The official model for written declarations to customs is the Single Administrative Document (SAD). The SAD delineates products and their movement around the world and is fundamental for trade outside the EU, or of non-EU merchandise. Merchandise brought into the EU customs area is, from the time of their entrance, subject to customs supervision until customs formalities are finished. Items are secured by a Summary Declaration which is documented once the things have been shown to customs authorities. Import customs procedures required in HELSINKI . Import Customs process in KOTKA. Process to import to TURKU. Requirements of customs to import to Alandd. Customs requirements in Helsinki to import. Customs needed to import to Kittilä. How can I clear customs to import in Kuopio. What Customs formalities required to import in Kuusamo. What should I do to import goods in Lappeenranta. How to get import customs permission in Oulu. Procedure to get customs clearance to import in Rovaniemi. Mandatory process need to complete import in Tampere. The way to get customs clearance process to import in TURKU.